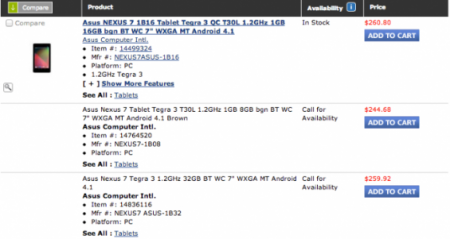 Nexus 7 Storage Size Steps Up? There’s been rumblings of a new Nexus 7 showing up on the interwebs recently. Currently the only two models available are 8Gb and 16Gb models, but Droid Life managed to grab a screen shot from the Carphone Warehouse inventory system which displayed a forthcoming 32Gb option. The information so far is that the release date will be October 24, so this fits in with the rumours of the Galaxy Nexus refresh which may or may not include a Samsung Galaxy Nexus 2, an LG Optimus Nexus (my favourite name of a Nexus device so far), a 5” HTC phablet, and a possible other host of other manufacturers. If even half of these are true, that’s an awful lot of buttery smooth, pure unadulterated, use-as-google-intended, Android goodness about to hit the shelves near the end of the month. The timing is interesting, as it could be meant to fire a shot across the bows of both Microsoft and Apple. MS has its Windows Phone 8 event scheduled for 29th October, and of course as we already discussed on the podcast, the buzz around a possible 7” iPad mini is reaching fever pitch. If the dates are correct, Google is coming out of the gates first, 5 days before Microsoft and just over a week in front of Apple. Barring the most recent iPhone leaks, the Cupertino based company is the best in the business at keeping a lid on things until they’re ready to announce and ship product. We won’t know whether 2nd November will be the iPad mini announcement date… probably until November 2nd. As usual, when we hear something concrete, you’ll be able to hit up coolsmartphone to get it hot and fresh.